Drew Burton’s pursuit of a Humphreys County trophy buck was epic, a two-month battle of man vs. deer. “There was just so much involved, so much that happened,” said Burton, 33, a farmer. “I’ve hunted my whole life, and I’ve killed a lot of bucks, and a lot of big bucks, but never has there been one that consumed me like this one. He was all I could think of for two months. He got in my head. Caesar died on Dec. 12, shot by Burton practically out of self-defense, exactly two months after the farmer first got trail cam photos of the massive Delta buck. 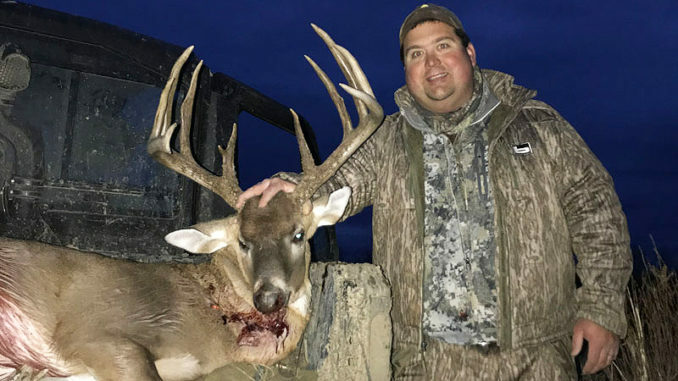 “It’s unreal, this story, but I swear it’s true,” he said, just before retelling the tale of his taking the 173-inch (B&C gross) 10-point with two stickers. The first pictures came from a patch of woods on the far eastern edge of the Burtons’ farmland, a low-pressured area practically on the property line. “That bothered me because the camera was about three feet from the line, and my neighbors hunt,” he said. “He was close to access to other people, other hunters. When I got those first pictures, it was hot, but to kill the buck where he was I was going to need a north wind. On Oct. 12 it was hot, which means south winds. Two more photos appeared and then nothing. It was beginning to look like it would take the rut to get this majestic buck moving. Drew Burton of Belzoni hunted this massive 12-point on the family farm in Humphreys County from Oct. 12 to Dec. 12. When he finally killed it, his rifle shot was less than 20 feet. Burton and a bunch of friends from Mobile had scheduled and booked a Kansas hunting trip for Nov. 12. He knew that while he was gone, there was a possibility that Caesar could meet his doom. “I started moving cams to the west; I had a hunch he was moving,” Burton said. 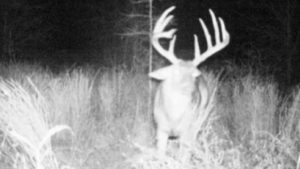 “On the fourth or fifth day, I got a blurry picture but I recognized it was Caesar because on the end of the right main beam, he had a crab claw or a drop tine. It was him. Burton killed a nice 9-point in Kansas but his mind was elsewhere. “All I could think about was Caesar,” he said. “Another friend of mine got a photo of him and text me while I was in a tree in Kansas and said it was a 170- to 180-inch and he was going to hunt him all week. 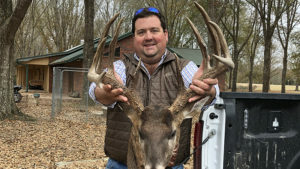 Burton was driving back from Kansas on the opening day of gun season in Mississippi Nov. 17. He was monitoring his cell phone the whole way, watching for posts of any big deer going down near his property. Burton was back home and his pursuit of Caesar was relentless. Rather, she had shot at Caesar. “My neighbor called me and said she had hit a big 10 and could I come help find him,” Burton said. “I told him I would come after I finished dinner. I was getting ready to go when he called and said there was no blood or hair or any trace. It appeared it was a clean miss. “Caesar, that’s it,” he said. “My buddies noticed and asked me what was wrong. I wasn’t feeling the duck hunt at all. What I was doing was scheming on how I could get in there and get Caesar. There’s no trees in there I could hang a stand on, and I tried calling around to see if anyone had a tripod so I could get off the ground. No luck. This trail cam from early on Dec. 12 told Drew Burton that Ceasar was where he could be killed, if he was chasing does. After duck hunting that morning, Burton went after him and killed him. So he did and he did get set up, but, boy, he was uncomfortable. 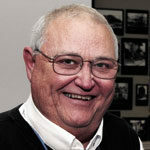 “I had replayed in my mind over and over for two months how I would kill this deer,” Burton said. “How it happened, didn’t come close to any of the scenarios. I have never really liked ground blinds and my mind was telling me I have to be the dumbest hunter in the world. While he didn’t feel confident he did have one thing in his favor. It was the rut, bucks were chasing, and that makes them do some stupid things. “At 3:15 I hear some low short grunts, and a young cow-horn spike came out. He never noticed me so that made me feel pretty good,” Burton said. “At 4 o’clock, I heard three very hard, deep grunts and instantly grabbed my binoculars. I didn’t know what was coming but I knew something was coming and I wanted to be ready. This was all happening in close proximity to the blind, and there was tall grass, like sage, everywhere. Burton was hesitant to move, they were so close. “Finally, she turned and ran away from me about 45 to 50 yards out, and then took a left, hooked around and started running straight at me and the ground blind,” he said. “She was getting closer, 35 yards, 30 yards, 25 yards, 15 yards, 10 yards … and he was right behind her. The buck was a main-frame 10 point with two stickers, one on a right brow tine and the other at the end of the right main beam. The antlers have an 18.5-inch inside spread, with long tines. The left G3 was the longest at 11.5 inches. “My biggest before that in Mississippi was a 151-inch buck,” Burton said. The farmer knows he blessed, not only with the opportunity to get the buck but also that his wife Lindsay had grown up in a family of hunters. “She knew how important this buck was to me,” Burton said. “Look, she’s nine months pregnant. We have a baby due Jan. 15, but she never complained about my obsession with Caesar. She loves to see me have fun and have success.